May this be a very special Juma Friday, with all the possible blessings Allah can bestow upon our honorable Mu’ammar al-Qathafi: health, longevity and the miracle of the Great Jamahiriya.…( a model for our world ). (original has 16 pages 56- ) I start mid page 57 through page 71…. …I have chosen another example for this study, the Great Jamahiriya and its leader since the al-Fateh revolution of 01 September 1969, Mu’ammar al-Qathafi. Here we find a reinterpretation of Islam and an explicit attempt to make this form of Islam the basis of a political ideology, the “Third International Theory”. The Great Jamahiriya claims to be the model state, the Utopia, of the practical application of this ideology, in its institutions and in its political actions. to establish Arabic as an international language. The transformation in the domestic policy is also called a “popular revolution” and its goal appears to be an almost corporativistic society’. al-Qathafi’s speech at Zwara on 16 April 1973, is regarded as the beginning of the “popular revolution”. The function of the “direct democrazy” and the political institutions in the Great Jamahiriya, falls outside the scope of this study, and I refer to H. Habib’s book on Libyan politics.*(8). 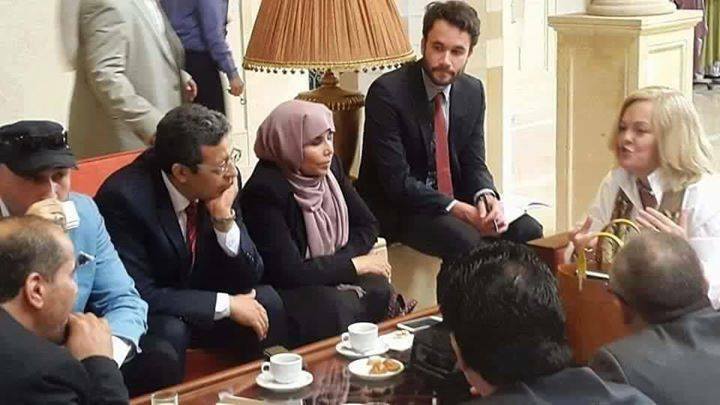 I intend to discuss here the connection between religion and ideology, the way in which Islam as a religion is applied, reinterpreted and transformed into a political ideology, by supplying the principles of Libyan policy, the “Third International Theory”. A. Information books and booklets issued by the Libyan Ministry of Information and Culture: The Revolution of 1st September, the fourth Anniversary, Benghazi, 1973. [Abbrev. : Revolution 1973] The Popular Revolution, Fundamentals & Objectives, Tripoli, January 1974. [Revolution 19746] La Revolution en Marche, Tripoli (? ), September 1974. [Revolution 1974c] 1st September Revolution Achievements, 5th Anniversary, Tripoli, 1974. [Revolution 1974a] “The popular revolution” is described by al-Qathafi 1974, 113 ff, cf. the booklet Revolu-tion, 1974b, 1 ff. and, as for al-Qathafi’s view on other constitutions, al-Qathafi 1976b, 1 ff. « al-Qathafi » à Lahore 25 Février 1974, Tripoli, s.a. [al-Qathafi.a.b] Discours du colonel Mu’ammar al-Qathafi… en Tunisie, Tripoli, s.a. [al-Qathafi s.a.c] Mu’ammar al-Qathafial-Kitāb al-Akhdar, al-awwal, Tripoli (? ), 1976. [al-Qathafi 1976b] Kadīyat ad-din fī-l-`ālam al-mu’āsir min akwāl al-akh Tripoli (? ), 1976. [al-Qathafi 1976a] To this we may add the ex tempore speech by al-Qathafi on religion and ideology at the Muslim-Christian Dialogue seminar at Tripoli, the 2nd of February 19769. Mu’ammar al-Qathafi was born in 1942, into al-Kadhādhifa, a nomadic tribe claiming descent from the Prophet Muhammad”, and his parents are still bedouin. Thus his ancestry befits an Arab nationalist, in that he is both bedouin and sharīf. A characteristic feature of his outlook is the appreciation of the moral values of the simple life of the bedouin and a certain contempt for the decadence of the coastal cities (12). al-Qathafi attended military school in Libya in 1963-66 and in England in 1966. In 1967 he began to study history at university (15). He was of course already politically active at that time. There is a close connection between al-Qathafi’s “philosophy of history”, his view of religion and his political behaviour. 10: The symposium was at Plaza Hotel in Paris, the 24th of November 1973. 11.” Cf. al-Qathafi, 1974, 24. 13: Cf. al-Qathafi, 1974, 26 and 35. 15: a-Qathafi tells about his studies in the first interview in ib. especially 26ff. 16: Human 47, cf. al-Qathafi 1974, 65f, al-Qathafi, s.a. a, 5 ff, and Revolution, 1974a, 10. 17: al-Qathafi, s.a. d, 16.
and “is the existence of the Israelis in Palestine due to any economic reason? Is there oil? Is there gold? This is again a religious, national conflict . . . Now, experts and pilots leave the nice life in other countries and come for religious and national purposes and reasons to fight the Arabs” (23). Since he regards Palestine as belonging to the Arabs, he concludes that “[. . 1 the conflict between Israel and us is natural and is one of the laws of nature” (24). The practical consequence of al-Qathafi’s interpretation of history is that he makes nationalism and religion the ultimate norms for every political decision. Wars and suffering will disappear if we can solve the problem of conflict between religions and nationalisms (26). In Libya’s foreign policy this involves support for several nationalist movements (e.g. the I.R.A.) (27) and for organisations aiming at the practical application of religion, while in her domestic policy it means the application of “Arabism” and the Islamic Sharī’a. The behaviour which results has its intellectual counterpart in a political programme or ideology, called the “Third International Theory” (28). It is named the “Third” Theory as it is supposed to supersede both the liberalism—capitalism of the West and the Marxist communism of the East. The Libyan nation “found the Western system based on exploitation, by individuals of the community where the rule says ‘Survival of the strongest’, which has reduced society to a collection of broken families, torn apart by crime, vice and degeneration of all values. Our nation also studied the eastern system based on exploitation of individuals by a party in the name of the dictatorship of class, where human beings have no freedom and are subject to absolute materialist ideas which contradict with human values” (29). 21: Cf. al-Qathafi, s a a, 8, al-Qathafi, s.a.d, 79f. 22: Cf. al-Qathafi, s.a. a, 9. 23: al-Qathafi, s.a.d, 80, cf. Revolution, 1974a, 18. 25: al-Qathafi, s a d, 16. 27: Cf. Revolution, 1974a, 20, al-Qathafi, s.a.c, 31, and al-Qathafi 1974, 128f, 157. 28: Cf. al-Qathafi 1976b, 1 ff. A short description of the “Theory” is given in the booklet Revolution, 1974c, 21ff, and in Revolution, 1973, 231 and 239ff, and in Revolution, 1974a, 9ff, al-Qathafi,1975, 133ff. 29: Revolution, 1974a, 9, cf. a1-Qathafi, s a d, 84f. 1. The oneness of ALLAH who governs the Universe”. 2. “The Heavenly Books” (Holy Quran, Bible [=Indjīl, The Gospel], Torah), as the sources for “unequivocal answers”. The Holy Quran is the absolute norm, the infallible authority, while human philosophies are subject to error. 3. The creation of Man and Universe by Allah, and Man as God’s khalīfa on earth. (32) (cf. Sura 2: 30/28). 4. The resurrection and the Day of Judgement and immortality. The faith in these constitutes religion as the source of moral obligation. (33). 5. The eternity of struggle between right and wrong and the inevitability of Allah’s predestination”. 30: Cf. a1-Qathafi, 1974, 124, cf. 49. 31: Cf. Revolution, 1974a, 10, Human 42. 32: Cf. al-Qathafi 1976a, 9f. 33: Cf: ib. 48, cf. a1-Qathafi, 1975, 122f. 34: Cf. Revolution 1974a, 10, Human 42. Point 4 is the most important. “The Third International Theory emphasizes moral obligation as an im-portant element in a civilised community, in personal dealings and inter-national relations. Such a moral obligation, in view of the Third Inter-national Theory, cannot be achieved without faith. Religion creates a moral deterrent in individuals and communities. Such a moral obligation `forces good work and prevents evil’ .”(35) (cf. Sura 3: 104/100, 110/106). It is often emphasized that Man needs religion (36). As for the practical application it is explicitly stated that the social rela-tions between individuals and between individual, family and state shall be in accordance with the Islamic Sharī’a (37). To “respect nationalism and hallow religion”, means, in the case of Libya, to stress the Arabism and to apply Islamic morals. 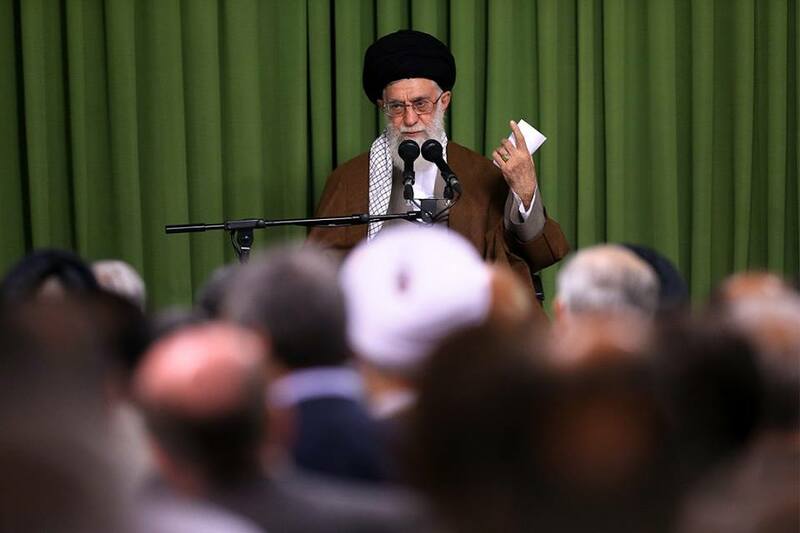 This process is called a “cultural revolution” and includes an ardent endeavour to eradi-cate “corrupted and foreign ideas and concepts” and prevent the infiltra-tion of such ideas from both East and West (38). 35: Revolution 1974a, 11, cf. Séminaire § 3. 36: Cf. al-Kadhdhāfī, s.a. a, 5. 37: Cf. Human 49, cf. Revolution, 1974a, 11. 38: Cf. Revolution, 1974b, 20, Revolution, 1974a, 12, Human 31. 40: Human 87, cf. Revolution, 1974a, 13. The Arabism of Mu’ammar al-Qathafi is also reflected in his own and the other leaders’ social behaviour (41). We can also mention one example of his extreme nationalism: Libya does not celebrate the First of May as a Workers’ day, as al-Qathafi wants a special Arab national workers’ day and not an international one (42). “Semitic” is often replaced by “Arab” so that the “Arabs” include the Accadians, the Phoenicians and Carthaginians etc.(44). “Arabism”, according to al-Qathafi always implies work for Arab unity (shu`b arabī wāhid, “one Arab people”), and this is one of the most important points in his policy”, the unity of all Arabs, Muslims and Christians; the tendency to local nationalism, Egyptian, Iraqi or Palestinian, is a violation of this principle. I shall illustrate with a quotation from an interview. The centre of the Arab Nation must be Egypt, Cairo being the capital of both Arabism and Islam (47), and al-Qathafi’s ideal of Arab unity and its confrontation with the policy of Egypt is one of the main factors in the complicated political pattern in the Arab world today. We may also notice that the dependence of the Libyan 01 September revolution on the “mother” revolution of July 23rd (1952) in Egypt and on the “Leader-Teacher” Nasser is often underlined in the speeches of al-Qathafi (48). 41: Cf. al-Qathafi, 1974, 47f. 43: Cf. ib. 56ff, cf. 49. 44: Cf. the lecture of prof. Ismail al-Faruqi at the Dialogue seminar, Hjärpe 94f. 47: Cf. al-Qathafi. a. a, 4 ff. The former Libyian ‘president’ (REMEMBER THIS IS THE TIME OF PRESIDENT JALOUD) emphasizes that political parties and factions have seriously harmed the Muslims, and therefore political parties (“fac-tionalism”), are forbidden in Libya, regarded as treason and punishable with death (49). The “Third Universal Theory” seeks to “hallow religion”, and this is one reason why al-Qathafi opposes communism, and even speaks of a “Holy war” (djihād) against it (50). The quotation also illustrates the pan-Islamistic principle in the application of the “Third Universal Theory”. Economic and political help is given to Muslims and to Islamic institutions all over the world”, and pan-Islamism is some-times designated as a “Holy war” (54). The solidarity of all Muslims is especially accentuated outside the Arab world, e.g. in al-Qathafi’s speech in Lahore (25th Febr. 1974) (55). In this way Mu’ammar al-Qathafi expresses a thesis common to all the reform movements, namely the distinction between “true” Islam and WAHHABI-Islam, as an empirical historical and sociological phenomenon. The goal of WAHHABISM is to substitute (at true Islam’s expense) their falsified version (for the which has hitherto dominated) (57). 49: Cf. al-Qathafi1974, 92f, cf. Human 31, and al-Qathafi 1976b, 12ff. 50: Cf. Revolution, 1973, 245, cf. 238f, and al-Kadhdhāfī, s.a.c, 38. 53: Cf. at-taharruk, 16 ff, Revolution, 1974 a, 23 f, Human 63 ff. 54: Cf. Revolution, 1974a, 23. 55: Cf. al-Qathafi, s.a. b, e.g. 5 f, 9. 57: Cf. al-Qathafi, s.a. c, 20. Mu’ammar al-Qathafi is especially anxious to emphasize that true Islam is in favour of modern science and technical and social progress (58). the verse “O mankind, we created you from a single pair of male and female” (Sura 49: 13 a) referring to equality of men and women, and “Verily the most honoured of you in the sight of Allah, is he who is the most righteous of you” (Sura 49: 13 b) to racial and national equality—and so on (60). The binding norm is of course the ‘Holy Quran”, but this must be solely the Holy Quran without tafsīr, without the traditional exegesis (i.e. THE HADATH). He speaks explicitly of a “Sola scriptura” principle, because of the impossibility of distinguishing between true and falsified a-hādīth (traditions) (62). This principle will eliminate the problem of “sectarianism” in Islam according to Mu’ammar al-Qathafi; and “practical solutions will then be found for the performance of religious duties”, fasting, praying etc., in the conditions of the modern world. between the “divine” Islam and the “historical” WAHHABI-Islam (65)—not to be confused with the distinction “true” and empirical Islam. The “divine” Islam, witnessed by the Holy Quran, is the monotheism of Abraham, Moses, Jesus, Muhammad, and all the Prophets, while the “historical” Islam embodies only the reli-gion and revelations of Muhammad (much of which has been distorted by the Hadith, and other works composed by the power-minded Wahhabi-Ulami). 58: Cf. E.g. al-Qathafi, s.a.d, 68f. 59: al-Qathafi 1975, 122 f.
60: Cf. al-Qathafi, s.a.d, 54ff. 61: Cf. e.g. Revolution, 1974a, 11. 63: Cf. al-Qathafi, 1974, 50f. 64: Cf. al-Qathafi, 1975, 20 f.
The basis of the “Third Universal Theory” is, according to al-Qathafi, to be found in the “divine” Islam, so that this Theory should also be adopted by Christians and Jews. But the Muslim believes in all the Prophets, and when the Christian (and the Jew) denies the prophethood of Muhammad there is a defect in his faith (66). He is convinced that Jews and Christians manipulated the Scriptures, and al-Qathafi compares (and not without reason) the Gospels with the Islamic Hadīth literature (67). The conversion of atheists to “divine” Islam, to the worship of God alone, is regarded as a common interest for both Christians and Muslims (68). —Say: 0 People of the Book! Come to common terms as between us and you: That we worship none but Allah; that we associate no Partners with Him; that we erect not, from among ourselves lords and patrons other than Allah’, says the Quran (Sura 3:64/57). 65: Cf. al-Qathafi s.a.a, 10f and 14ff, al-Qathafi, 1974, 48f, and Revolution, 1973, 240 f.
66: Cf. al-Qathafi, s.a. a, 12f, cf. al-Kadhdhāfī, 1974, 49. 67: Cf. al-Qathafi, 1976c, cf. al-Qathafi, s.a.a, 11. 68: Cf. al-Qathafi, s.a.a, 22. 69: al-Qathafi, s.a.d, 86, cf. al-Qathafi, s.a.a, 21. We may emphasize that by “socialism” al-Qathafi does not mean socialism in the western sense (72), since for instance private ownership (if non-exploiting) is safeguarded, and inheritance regulated according to the Islamic Sharī`a (73). 70: al-Kadhdhāfī, s.a.d, 66, cf. Revolution, 1974b, 29f. 71: al-Kadhdhāfī, s.a.d, 67, cf. al-Kadhdhāfī, 1974, 54. 72: Cf. Human 42, al-Kadhdhāfī, s.a.d, 21. 73: Cf. Human 25. 74 Cf. Revolution, 1973, 161ff. 75 Ib. 163 f.
Islam is hallowed, acts against the precepts of religion are punished (76), the Sharī a is applied (77), national liberation movements are regarded as djihād and supported”, at international conferences. 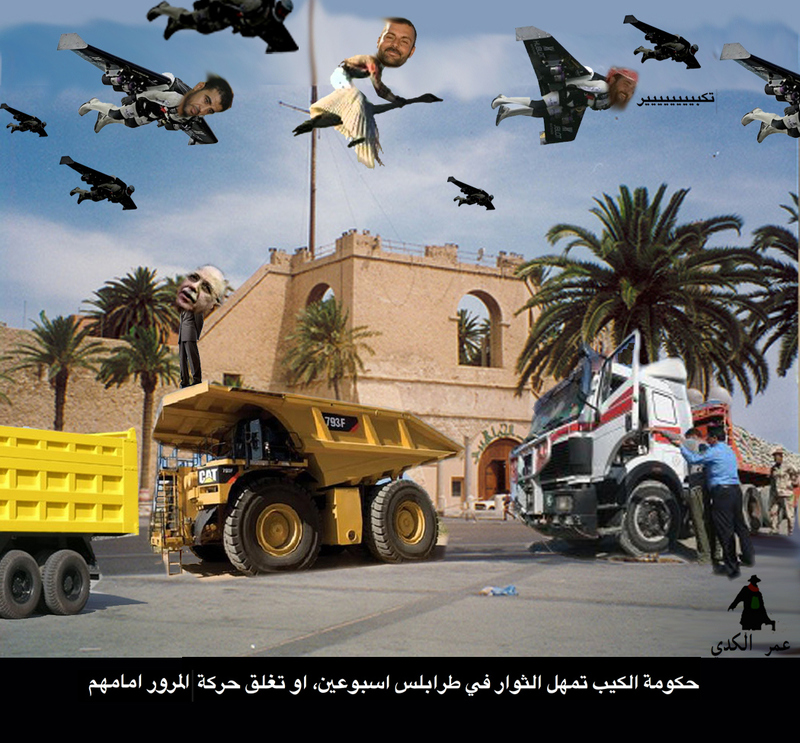 Libya has demanded the suppression of drugs and strong drinks (78) etc. The aim of the GREAT JAMAHIRIYA, and its leader Mu’ammar al-Qathafi is to create in Libya a “revolutionary ex-ample”, a model for an Arab Islamic state” and for the entire world, the practical application of Islam in political and social life, an Islam regarded as a “secular religion”. Unprinted source al-Qathafi, M., 1976c., An ex tempore speech by Mu’ammar al-Qathafion religion and ideology at the Muslim–Christian Dialogue seminar at Tripoli, 2 February 1976.
al-Ikhwān al-Muslimūn. EI 3. EI Encyclopaedia of Islam. Gilsenan, M., 1973, Saint and Sufi in Modern Egypt. Oxford. Goldziher, I. –Jomier, J., 1965, Djamāl al-dīn al-Afghānī. EI 2. Habib, H., 1975, Politics and Government of Revolutionary Libya. Montreal. Hjärpe, J., 1976, Det islamisk–kristna dialogseminariet i Tripoli, Libyen. Svensk missions- tidskrift 2. Human, 1976, The Human March in the Libyan Arab Republic [=Masīrat al-insān fī al-djum- hūriyyat al-`arabiyyat al-lībiyya]. Rome. al-Kadhdhāfī, M., S.a. a, Allocution du Président Muammer al-Qathafi et les responsables de t information et des cadres de l’ USA au Caire .. Portant sur la Religion, le Natio- nalisme et les problèmes s’y référant 5 Moharram 1393 H, 08 Février 1973. Tripoli. — S.a. b, Discours du frer (sic!) président du conseil du commamdement (sic!) de la revolu-tion tenu au complexe sprotif « Gueddafi » d Lahore 25 Février 1974. Tripoli. 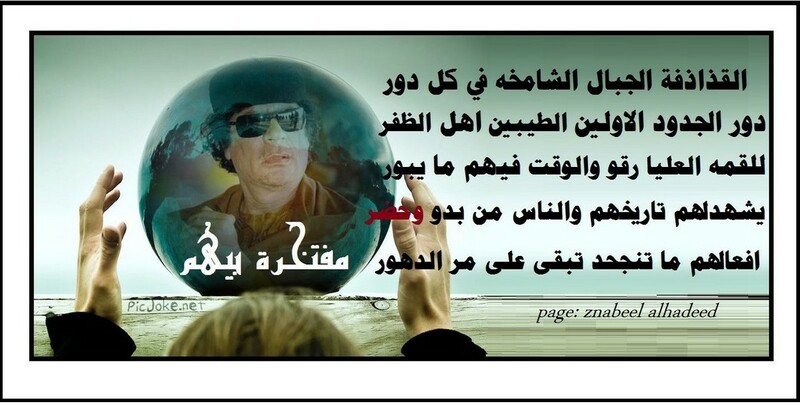 — S.a. c, Discours du colonel Moamar Gadhafi . en Tunisie. Tripoli. — S.a. d, The Paris Symposium, the intellectual meeting between the East and the West. Beirut. — 1974, Thus spoke Colonel Moammar Kazzafi. Beirut. — 1975, Discourses by Mu’ammar el-Qathafi, Chairman of R.C.C. published in the Arab and International Press. S.l. — 1976a, Kadīyat ad-din fi-l-‘ālam al-mu’āsir min akwāl al-akh al-‘akīd. Tripoli (?). — 1976b, al-Kitāb al-Akhdar, al fast al-awwal. Tripoli (?). 76 Cf. Revolution, 1974b, 9. 77 Cf. Revolution, 1974a, 156. 78 Cf. al-Kadhdhāfī, 1974, 36, Revolution, 1974a, 20. 79 Cf. Revolution, 1974a, 21. 80 Cf. ib. IV, al-Kadhdhāfī, 1975, 15f and 136, Revolution, 1974 b, 31, and Human 12f. Religion and ideology 71 Laoust, H., 1971a, Ibn `Abd al-Wahhāb. El 3. — 1971 b, Ibn Taymiyya. El 3. Revolution, 1973, The Revolution of 1st September, the Fourth Anniversary. Benghazi. — 1974a, 1st September Revolution Achievements, 5th Anniversary. Tripoli. — 1974b, The Popular Revolution, Fundamentals & Objectives. Tripoli. — 1974c, La Revolution en Marche. Tripoli (?). Séminaire, 1976, Séminaire du dialogue Islamo-Chrétien, Tripoli 1-6 Safar 1396/1-6 Février 1976. Recommandations et résolutions. Tripoli. at-taharruk, 1976, at-taharruk as-siyāsī lī-l-djumhuriyyat al-‘arabiyyat al-lībiyya fi ittidjāh ‘aṣr al-djamāhīr. Tripoli. Watt, W., 1956, Muhammad at Medina. Oxford. — 1961, Islam and the Integration of Society. London. 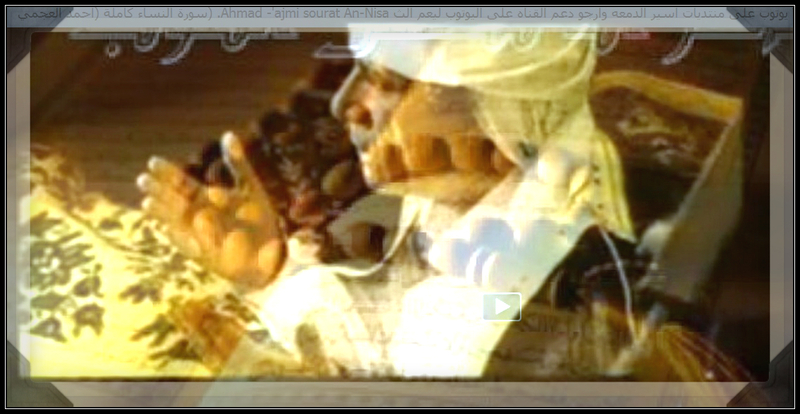 The ‘children of Sheikh Abdul Salam Asmar’ a partagé la vidéo de ‘eye Rafla in every place and time’. Allah bless Aataga … Akhkhkhkhkh Aazemn? Was this being an infidel, to see into Allah ? Do you know of you ….? Abaya and how al-Qathafi was Mguet-atkm ! as you know, and you Matpettm ..
‘The children of Sheikh Abdul Salam Asmar’ a partagé la vidéo de ‘poet Ibn Badr – Official’. Suffice Allah and yes, the agent (SATAN)..
meaning Tripoli ‘Friday Aahfrh blood’ ! Members of ‘the battalion at the center of Zintan Martyrs Fnaitees’ to support the Libyan Army. Lord dampers requires him to eat and decide their feet, Lord. Your prayers are asked for our Libyan Army. It declared the rebels of ‘Zintan Military Council’ in a statement that the expensive of the Council has the power to expel today Thursday, 28/05/2015 vandals who approached the security field to base Wattayah. Many groups, were destroyed and a number of armed tank cars. 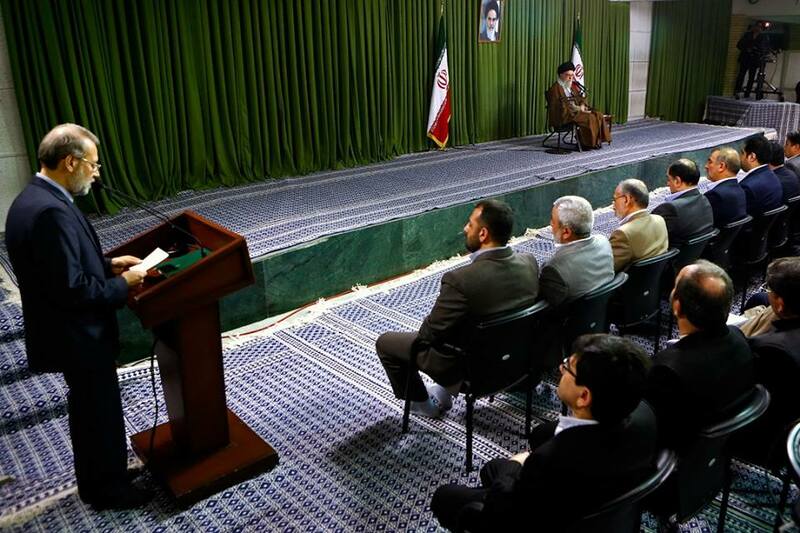 The council said that while it remind residents of the nearby areas to assume their responsibilities to prevent terrorists from using their land as a pass through, we tell them that our patience has begun to be at an excess, which forces us to take other measures. We are not responsible for the negative consequences. Provide the joint forces of the Army and the forces supporting, in the axes of Wattaya, and we inflicted those militias affiliated to ‘Dawn Libya’ amongst the Amazigh, with heavy losses. Allah is great and thankfully .. Significant progress Libyan Army support and strength to him in all axes and special Wattaya axis and the morale of the Libyan army Champions support and force him high and is okay in all axes. call for their support of the ‘Libyan Army’ and supporting forces in the Western Region. Mohammed of the Chadian population surnamed ..’Rndh slave’ .. He is one of the wounded in al-Sabri. Please take all cautionary means. Random shells fall on the land area wires caused the deaths of a mother and son! 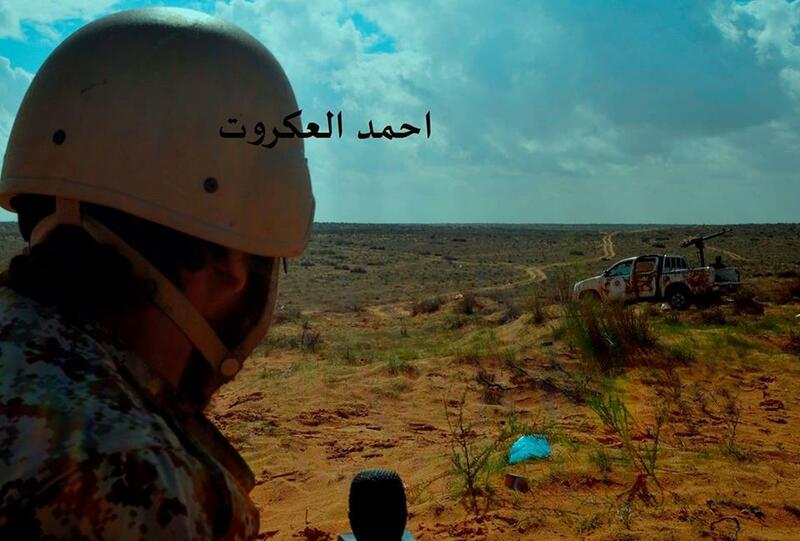 Probe hopes Jahlha to know why we say that (gently/Cyrenaica troops are a dust protector). Newly disclosed Pentagon documents prove what we’ve known for a while now: the Obama administration knew as early as 2012 that weapons were being sent from Benghazi, Libya, to rebels in Syria. But did they just “know” or was it part of the plan? These official documents of the Obama administration add to the large amount of evidence proving that the actual chaos and havoc wreaked by extremist groups in the Middle East was deliberately created by the U.S. and its allies and is not the result of a “failed foreign policy”. Weapons from the former Libya military stockpiles were shipped from the port of Benghazi, Libya to the Port of Banias and the Port of Borj Islam, Syria. The weapons shipped during late-August 2012 were Sniper rifles, RPG’s, and 125 mm and 155mm howitzers missiles. During the immediate aftermath of, and following the uncertainty caused by the CIA, in the destruction of the Great Jamahiriya in October 2011 and up until early September of 2012, weapons from the former Libya military stockpiles located in Benghazi, Libya were shipped from the port of Benghazi, Libya to the ports of Banias and the Port of Borj Islam, Syria. The Syrian ports were chosen due to the small amount of cargo traffic transiting these two ports. The ships used to transport the weapons were medium-sized and able to hold 10 or less shipping containers of cargo. Although the documents do not reveal who was responsible for sending weapons to Syria, it is quite obvious from the language used in the documents that it was a US initiative and the CIA presence in Benghazi at the time suggests that US intelligence was behind this gun-running operation. 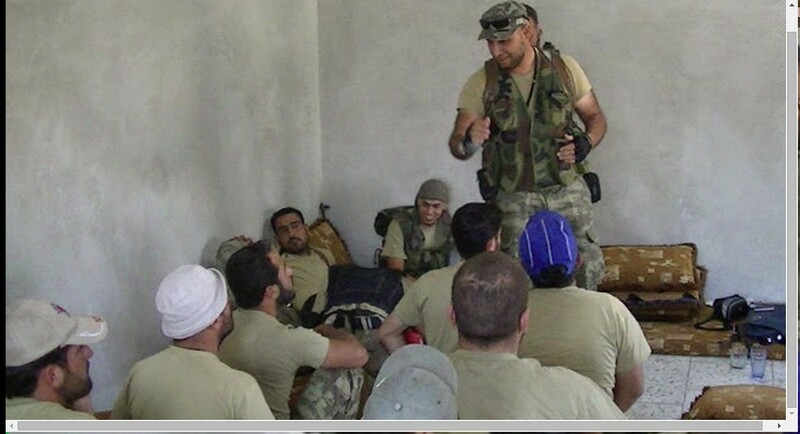 PICTURE above shows LIBYA’s Tripoli ‘mayor’ el-MAHDI HARATINE training insurrectionists, in Syria, as also did Abdul Hakim Belhadj, the TRIPOLI ‘governor’. On 11 September 2012, the U.S. consulate in Benghazi was attacked. Four people were killed, including the (so-called) U.S. ‘Ambassador’-spy Chris Stevens (actually an American espionage spy) and two CIA officers. The Agency, for its part, doesn’t want anyone knowing what it was doing in the Libyan port city. Sources told CNN that 35 Americans were in Benghazi that night — 21 of whom were working out of the annex — and that several were wounded, some seriously. Among the questions are whether CIA missteps contributed to the security failure in Benghazi and, more importantly, whether the Agency’s Benghazi operation had anything to do with reported heavy weapons shipments from the local port to Syrian rebels. Last January, the Citizens Commission on Benghazi concluded that the “Obama White House and the State Department under the management of Secretary of State Hillary Clinton “changed sides” (HAH! HAH…really?) in the war on terror’ in 2011 by implementing a policy of facilitating the delivery of weapons to the al-Qaida-dominated rebel militias in Libya attempting to kill Muammar Qathafi and destroy the GREAT JAMAHIRIYA”, WND reported. We’ve also known for several years that Western special operations forces were on the ground training rebels to fight against Assad. Several articles in the British media confirm that British Special Forces are training Syrian rebels. The underlying pattern is similar to that of Libya where British SAS were on the ground prior to the launching of NATO’s military intervention. 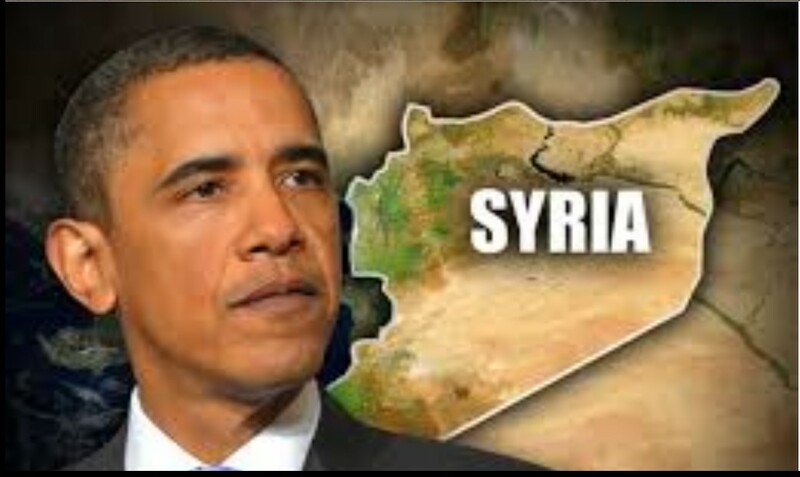 The US and some of its European allies “are using defense contractors to train Syrian rebels on how to secure chemical weapons stockpiles in Syria,” according to “a senior US official and several senior diplomats,” CNNreports. The deadly chemical weapons were later used against Syrian soldiers and civilians. 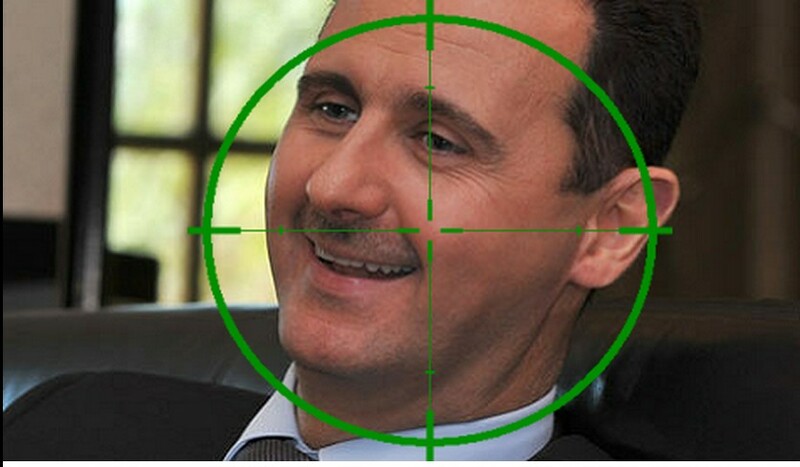 The U.S. government and the Western mainstream media tried to blame President Assad, but a UN investigation later concluded that it was the rebels who had used the chemical weapons. The U.S. did exactly what was needed to create “the ideal atmosphere” for Mosul and Ramadi to fall and for ISIS to declare an “Islamic state”. With the fall of Mosul last June, the recent fall of Ramadi in Iraq and numerous reports about the U.S. delivering weapons and ammunition to ISIS, the recently disclosed official documents show once more that the U.S. gun-running operation created “the ideal atmosphere” for Al Qaeda Iraq and “the rise of ISIS” in the region. The war against the so-called Islamic State can thus only be a flatout lie. As a solution to the problem they created, with full knowledge of the consequences, the U.S. and its allies offered a military intervention with the stated intent of fighting the enemy they had created while covertly supporting it in order to sustain the war, for the greatest benefit of defense contractors and Israel, which has the a lot to gain in the dismantlement of neighboring states. This shift in foreign policy phraseology coincided with the inauguration of the Baku-Tbilisi-Ceyhan (BTC) Oil Terminal in the Eastern Mediterranean. The term and conceptualization of the “New Middle East,” was subsequently heralded by the U.S. Secretary of State and the Israeli Prime Minister at the height of the Anglo-American sponsored Israeli siege of Lebanon. Prime Minister Olmert and Secretary Rice had informed the international media that a project for a “New Middle East” was being launched from Lebanon. This announcement was a confirmation of an Anglo-American-Israeli “military roadmap” in the Middle East. This project, which has been in the planning stages for several years, consists in creating an arc of instability, chaos, and violence extending from Lebanon, Palestine, and Syria to Iraq, the Persian Gulf, Iran, and the borders of NATO-garrisoned Afghanistan. Note: The above map was prepared by Lieutenant-Colonel Ralph Peters. It was published in the Armed Forces Journal in June 2006, Peters is a retired colonel of the U.S. National War Academy. 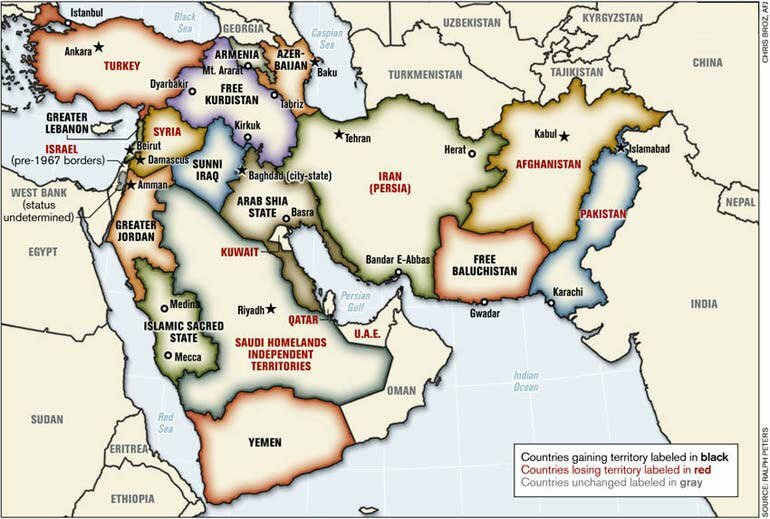 (Map Copyright Lieutenant-Colonel Ralph Peters 2006). Although the map does not officially reflect Pentagon doctrine, it has been used in a training program at NATO’s Defense College for senior military officers. This map, as well as other similar maps, has most probably been used at the National War Academy as well as in military planning circles (Mahdi D. Nazemroaya). All the evidence is there to prove ISIS and their ilks are instruments of U.S.-NATO-Israel foreign policy. How long can the Western mainstream media ignore this overwhelming evidence that the U.S. and its allies are supporting the entities they claim to be be fighting in the Middle East without totally losing the very little credibility it has left? This war on ISIS is just another disastrous endeavor for populations in the Middle East, another military intervention under a false pretext, another lie to divide and conquer. And once more, the Western mainstream media has failed to report the truth. Below is a selection of articles on this topic. – If domestic potential is being used, it becomes easy to solve nuclear issue; if we increase the domestic power other issues will be solved too. 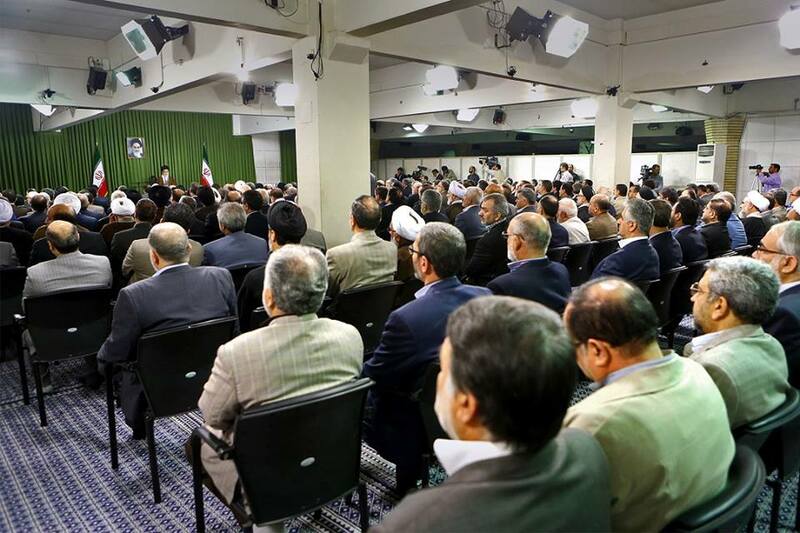 – Our stance on nuclear issue is what we stated publicly. The exact same points are being said to officials; these are our basic stance. 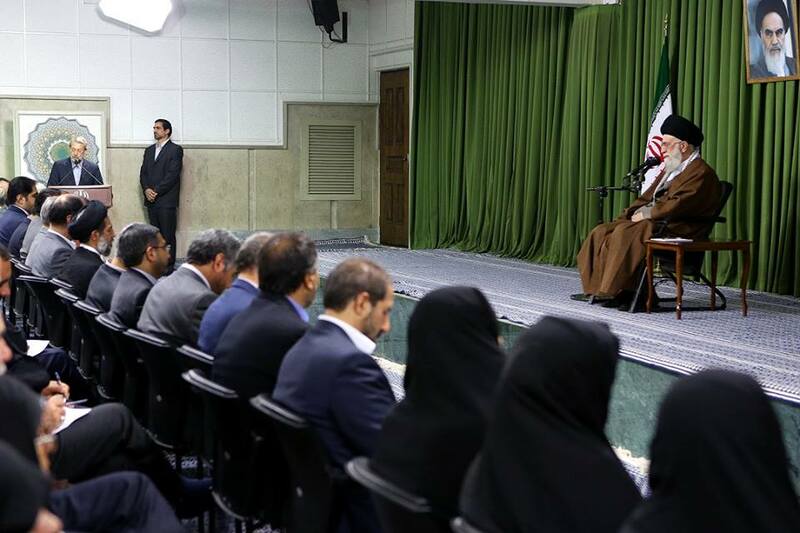 – I know that we are facing a lack of resources and sanctions had an impact on this; the solution is to economize and observe financial discipline. This entry was posted in Actualités et politique, History, Mankind and tagged Cyrenaica, Green Nafusa Western Mountains, Iran, IRAQ, Mu''ammar al-Qathafi, Syria, TRIPOLI, Turkey, USA, WESTERN REGION. Bookmark the permalink. I am always happy to read your news and commentaries. I am so interested in how the Leader Muammar Al Gaddafi’s ideas, can be applied outside of Libya. I fully believe in the Third universal theory, as capitalism and communism have both proved their moral and spiritual bankruptcy and are no longer suitable for the evolving humanity. The awakening masses of people are searching to build alternatives. Though I am not Muslim, I totally agree that no system will suceed if the love of Allah, of His creation and respect of universal code of morality is absent. If you have other commentaries to share with us about how the Jamahiriya functioned in ways that we can apply it at a grassroots level, I would be so grateful. I have read and continue to study the Green book. But few of us had the fortune to see it in practice. Libya is at the front of a war for humanity. I do believe that many ideas of the brother leader will be adopted as basic social philosophy in tomorrows world. We are grateful for any ideas you want to share in this regard. The IPCO coordinates, advocates and provides information and guidance, relative to national people’s conferences (congresses). The following structures and terminologies are hereby proposed with two phases in any geographical area: the “joining” phase and the “convening” phase. The “joining” phase comes first, as it is not possible to convene conferences that will be able to enact popular legislation (policy upon consensus decision-making) if there are insufficient numbers. I.E. it is obvious, that 10 people cannot convene an Australian People’s Congress, nor even an Alice Springs People’s Conference and pass recommendations or resolutions that would have any binding authority, when even the number of political party members of parliamentary dictatorship are higher. The “joining” phase can be considered sufficient to pass to the “convening” phase when the number of members and indeed participants are higher than the “representatives” of traditional (dictatorial) political power in that area, or when the members of the conferences themselves consider their numbers sufficient to lay claim to being the legitimate organs of people’s power (Jamahiriya) government. During the “joining” phase, all legislative organs (conferences) are called CONFERENCES but when achieving the “convening” phase are re-branded as CONGRESSES. However, the convention of Basic People’s Conferences will remain named as Basic (Local) People’s Conferences, the secretariats of which make up the Municipal (Area) People’s Congresses to which the various decisions of BPCs are brought. At first, people join from the nearest level to them, which for most will be the World People’s Conference. When there are sufficient members in a particular nation to warrant the forming of a National People’s Conference, and a willing interim general secretariat is in place, then those members are contacted and urged to contact their National People’s Conference secretariat to join their NPC. Again, when sufficient numbers within a given federal state or city or local region have joined, the State/Municipal People’s Conference can be declared, and the same down to the Basic (Local) People’s Conference. Then, when there is sufficient members of the BPCs in an area, that area will now have a State/Municipal People’s Congress, and so on. For those who are unfamiliar with direct participatory democracy and the forming of consensus at the grass roots level, and for all those wishing to facilitate people’s conferences here you will find some information at Green Charter Wiki. International Green Charter Movement is (r)evolutionary. It is the (r)evolutionary committees movement. One of its prime tasks, is to advocate for the human rights and freedoms of the International Green Charter (IGC). The Green Charter carries a moral and legal weight like no other human rights document, due to the fact a million people participated in its drafting! Thus, (r)evolutionaries, who are encouraged to study The Green Book to get to know some ideas and proposals on solving the problems of power, wealth, arms, education and other social issues, form themselves into Green Charter Revolutionary Committees if they agree with the IGC and wish to work for achieving these advanced human rights and freedoms in their community. They are convinced that The Green Book presents the best solutions to the problems of power, wealth and the natural social order showing the way forward to the people’s self-governing society (Jamahiriya). Thus, the IGCM is a collection of Green Charter (R)Evolutionary Committees, by whatever name. Thank you so much for taking the time to give such a helpful answer. I will check out the links you gave me. Greatly appreciated!